IT companies of India and Russia are upbeat about forging tie-ups in research and new software development, which will provide a boost to the Indian government’s Digital India mission. The IndiaSoft annual international conference of information technology was recently held in New Delhi. It was attended by 12 residents of Skolkovo Foundation’s Information Technologies Cluster. Leading Russian IT companies participated in the conference, which included software developers working on computer-aided design (CAD) from the C3D Labs Company, Ivideon, video monitoring service via the Internet –CashOff, which deals with banking services, developers of OCR technology and online translators from ABBYY Language Services. 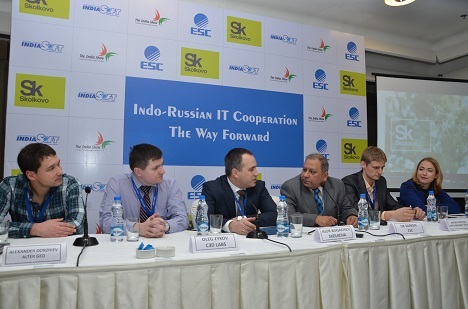 Igor Bogachev, executive director of the Skolkovo IT-Cluster, admitted that Russian developers were impressed with the level of the Indian IT-industry, and stressed that one of the goals in coming to the IndiaSoft Conference was to look for ways to participate in the Indian government’s programme Digital India. Russian software products have already found potential customers in India. In particular, according to Igor Bogachev, three Indian oil companies have shown an interest in software developed by Rock Flow Dynamics, a Skolkovo resident. This company’s software is already being used in the development of new oil fields in India. A resident of Skolkovo, the Zingaya Company brought to India the VoxImplant platform for telecommunication services, which allows web developers to build systems for IP-telephony, video calls, and automated services for calling customers. Alexey Aylarov, the founder of Zingaya, says that his company managed to find a common language with the Indians, and now ten local developers are interested in its products. Another exhibitor, ABBYY Language Services, brought its flagship product to India. According to Anton Voronov, vice president for Innovation at ABBYY Language Services, this includes cloud-based automation of translations for major companies working for on the global market, as well as a free version of this software for freelance translators. Voronov explained that many Indian companies produce software products focused on global markets, and therefore need support for a large number of languages. The C3D Labs Company proposed to Indian colleagues that they work on the joint development of CAD software, which the Russian company has created. According to Oleg Zykov, head of C3D Labs, today more than 50% of this market is dominated by American products. However, he voiced optimism that independent software developers should be able to capture a significant market share in the BRICS countries. Zykov said that CAD products “are used in virtually all sectors, including in the defence and space industries”, and so have having their own software could be very useful for Russia and other countries. Zykov believes that it could take up to five years for Russia and India to develop their own software. Bogachev, executive director of the Skolkovo IT-Cluster, said that a new programme of the foundation was presented at the IndiaSoft conference. Under this programme, foreign companies will be provided with assistance in opening an office in Russia and receive research grants. “We believe that there are huge prospects for the formation of joint Russian-Indian companies that will work in the high-tech research and development,” said Bogachev. “The strength of Russian experts lies in their ability to come up with completely new product ideas, while the Indians have the skills to develop and produce these, based on the required technical specifications.” According to Bogachev, venture capital funds, registered in Skolkovo are willing to invest $10-20 million into joint innovative start-ups in Russia and India by the end of 2015.